I have a handy-dandy focaccia recipe that comes together very quickly, is easily customizable, and never fails to impress. I've shared variations on it before, such as this Strawberry Focaccia (the ultimate version), this savory focaccia with prosciutto, asparagus, and shallots, and this Peach Focaccia. In honor of today's Twelve Loaves them, I decided to share a savory version featuring olives. If your fridge look anything like mine, you probably have a couple of half-full jars of olives claiming residency on the shelves. Turning them into a batch of savory, salty olive tapenade is one of my favorite ways to put that prime fridge real estate back on the market. I almost always have some capers and a half a lemon hanging out, too. Garlic and olive oil are always in my kitchen. All it takes to make some of this addictive relish is a few pulses in the food processor. A quick batch of tapenade tumbled atop this bubbly dough worked out beautifully. This loaf of focaccia would make a wonderful addition to any lunch or dinner table; it would also be tasty alongside a cheese tray or some charcuterie. But I just went ahead and called it lunch all by itself. You know, because I could. 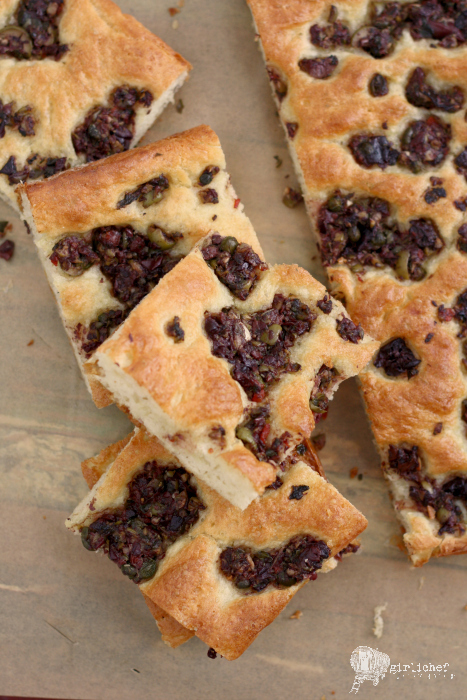 Focaccia bread topped with a salty, savory olive tapenade. This impressive bread comes together in a couple of hours, with minimal effort. Rinse olives, then pat dry. Combine all ingredients in bowl of a small food processor and pulse until coarse, scraping down the sides as you go. This will only take a minute or two. Combine the yeast, water, and sugar in a large bowl until the yeast blooms (looks creamy). Using a wooden spoon, stir in the flour and salt until the dough comes together. Turn out onto a lightly floured work surface and knead a few times. The dough should be slightly sticky - flour your hands lightly to keep the dough from sticking to them, but don't let the dough become too stiff. Flick a bit of water onto a 15"x10" (or thereabouts) rimmed baking sheet, and line it with wax paper. Pour 2 tablespoons of the olive oil onto the wax paper and spread it around with your hands. Plop the dough onto the sheet, and use your hands to gently coax and stretch it into the shape of the pan. Lay a sheet of plastic wrap over the top of the pan and let sit until the dough rises up just over the edges of the pan, 45-60 minutes. Stir the tapenade, then scatter it over the risen dough; drizzle the remaining tablespoon of olive oil over the top. 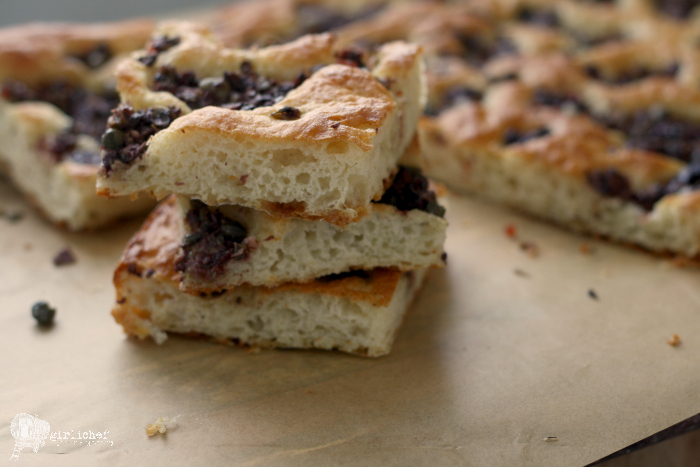 Slide into preheated oven and bake for about 25 minutes, or until the focaccia is golden and a bit crisp on the edges. Remove from the oven, and very carefully slide the loaf, wax paper and all, onto a wire rack to cool a bit. Our host this month is Karen from Karen's Kitchen Stories, and our theme is Olives. 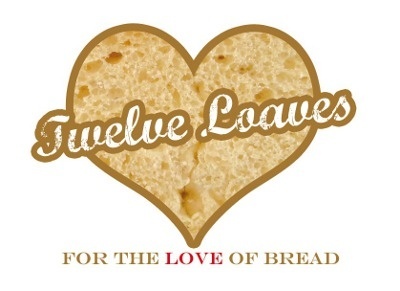 For more bread recipes, visit the #TwelveLoaves Pinterest board, or check out last month's mouthwatering selection of #TwelveLoaves New Year Challenge Breads! 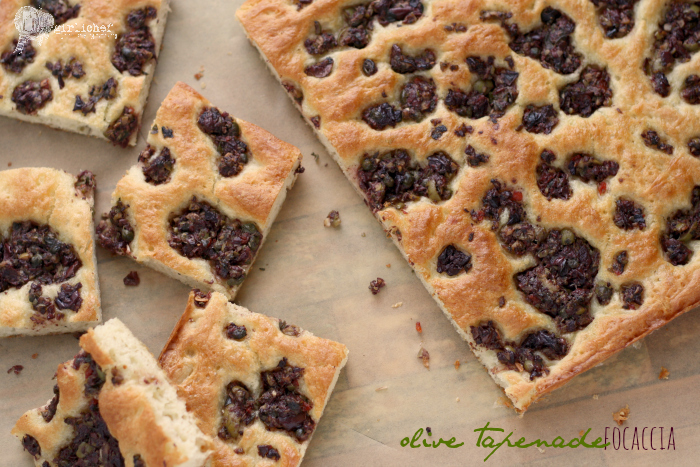 If you'd like to bake along with us this month, share your Olive Bread using hashtag #TwelveLoaves!